This beautiful board is perfect for serving a cheese and charcuterie appetizer, yet it can be used for small cutting tasks. Epicurean cutting boards are made from eco friendly materials whose organic content provide the unique look and texture of each board. The slightly different colors represent a unique blend of wood fibers that Epicurean uses, layered together and pressed with food-safe resin to form a surface that is best for food preparation. 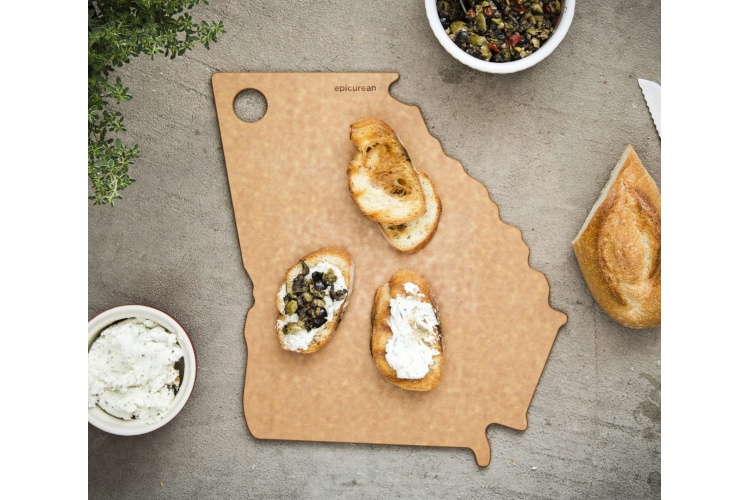 The collection of State Boards from Epicurean make lovely gifts and allow you cook with a taste of home, made in the U.S.A. The Georgia board, with its interesting coastline and undulating rivers, make it one of the more elegant options.